This morning started with cloudy sky. Couldn't barely see the sunshine from the balcony. It has been raining since Monday and we will still expect rainy days for the whole week. I'm bringing my umbrella today just in case. I need to go to some places that doesn't have basement parking. A day like this, basement parking is a life saver. Kids are back into their normal routines right now. They even already started new project and did their homework yesterday. All the students in Grade 6 are free from extra curricular activities this semester so they can concentrate for their final exam on May. I know ... this is just the first week of the new semester and I already talk about the final exam? Okay, I wouldn't talk about it far but Big A has been preparing for the final exam even from the last semester. Depressing enough? Let's move to the other topic then hehehe ... We got a good news that the new school that we applied for the kids has accepted them. Both of the kids will move to this new school in July when the new school term normally starts here. Hope they can adapt well later. 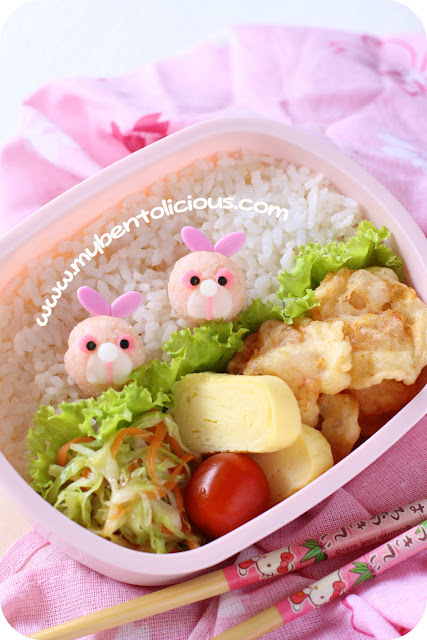 Inside the box : rice, pink twins (made from rice that I mixed with decofuri, nori, egg sheets, jelly balls, food picks), fried prawns, tamagoyaki, cabbage & carrot stir fry, and cherry tomato. Mayonnaise was put separated in a small container. So creative to use the leaf picks as bunny ears!! I'm still looking for those. I finally found the angel wings picks that I first saw you use. Yay! @Christy : hahaha ... Thanks a lot Christy! Eeww...those bunnies are seriously looking at me! very pinky and sweet, Lia... Congrats for the kids. Hope they will adapt well in new school. @prince n princess mum : Thank you! lovely pink bunnies peeping behind the grass..haha..
oh..so your kids are changing to a new school again? Awww, so cute! The pink bunnies look so sweet :) It's wonderful news that they both got accepted to the new school, Congratulations! Cute rabbit ears! So clever use of picks :), as usual ^_^. Hope the rain will give a break and you get some dry weather over there! It is wet here too... the snow melted away ;_;. Oh! Had to ask, what is the capacity of this bento box? Such a cute lunch! Kids here are taking pre-tests this week to prepare for exams later in the year. Even when it's far away it's all about the exams lol!